The Forensic Chemist II is a highly technical, professional position conducting validation and performance of routine and non-routine assays required by a post-mortem, forensic toxicology laboratory. This position supports the NC Office of the Chief Medical Examiner in the discovery of primary and secondary causes of unattended, unwitnessed, accidental, suicidal or homicidal deaths. The Forensic Chemist II self-assigns work from the pending list of analyses for the isolation of drugs from biological specimens and pertinent evidence using advanced analytical instrumentation. The testing performed is complex, the specimens can be difficult (unusual matrices that interfere during analysis) and target analytes are generally considered to be unknown prior to testing. Results of the work are combined with autopsy and investigation findings to render final conclusions as to the cause and manner of death. Decisions may directly affect the safety and health of the public where dangerous and or toxic substances are identified as a cause of death. The Forensic Chemist II is also responsible for the review of analytical data from assays such as volatiles analysis, organic base and LC screens, LC-MS confirmations, color tests and carbon monoxide. Additionally, this position includes the review and certification of ethanol cases. The Forensic Chemist II can give testimony as to the testing performed in the laboratory for these ethanol cases (fact witness) and render opinions regarding the toxicological significance of the ethanol results (expert witness). Understand the principles, practice, and current developments in the field of analytical toxicology. Laboratory protocol, procedure, and techniques associated with medico-legal investigative work including the related rules of evidence and legal principles. Ability to operate highly sophisticated analytical instrumentation, including mass spectrometry techniques (GC-MS, LC-MS). Experience in laboratory research principles and techniques pertaining to statistics, analytical chemistry, biochemistry and toxicology. Experienced in independently performing and recording complex standardized laboratory tests and procedures. Demonstrated ability to troubleshoot the following techniques and instrumentation: SPE/LLE; GC-MS; LC-MS; UV/Vis. Demonstrated ability to express technical information clearly, written and orally, when reporting results, testifying or explaining procedures to others. Previous analytical laboratory experience, including experience with Gas Chromatography (GC) and GC-MS instrumentation, is preferred with preference given to those candidates who have worked with a wide variety of analytical instrumentation, Liquid Chromatography-Mass Spectrometry (LC-MS) techniques in particular. The Forensic Chemist II will work in a laboratory and office environment of a moderately physical nature. The work may require long hours in a standing position. There is some occasional lifting, carrying of equipment, and sometimes awkward positioning to achieve desired results, especially for specimen maintenance. Bachelor's degree in chemistry from an appropriately accredited institution and four years of progressive chemistry laboratory experience; or an equivalent combination of education and experience. Do you have the Education Required? See available on-line and campus-based degree programs now! To sign up for the Crime Scene Investigator Newsletter, go to the subscribe to the newsletter page. For more job listings, return to the Crime Scene Investigator Employment page. 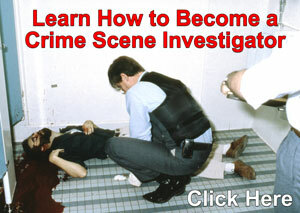 To learn how to get a job in crime scene investigations or forensic science, go to the How to Become a Crime Scene Investigator page. 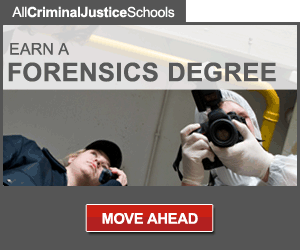 For a listing of colleges and universities offering degrees in crime scene investigations and forensics, go to the Colleges and Training page. NOTE: The crime-scene-investigator.net is not responsible for typographical errors or omissions in employment notices on this web site. Often, employers change final filing dates, change duties and/or requirements, or close employment openings without notice. If you are interested in a job posted on this site be sure to contact the employer to see if changes in the filing date or job announcement have been made. Employers can also provide more information about open positions that does not appear in the announcements on these pages. Copyright 2000–2019 Crime Scene Resources, Inc. All rights reserved.